Inside Prontera Church, first room on the right. 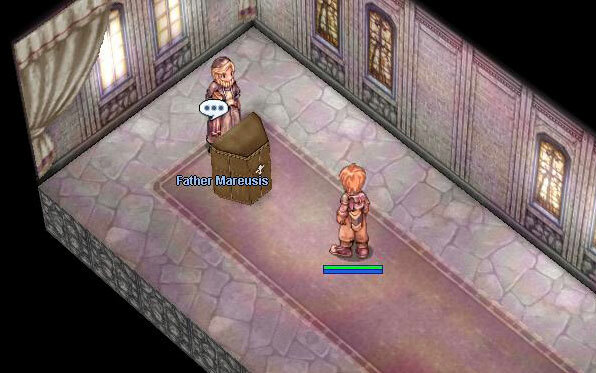 Simply talk to Father Mareusis to signup for the acolyte quest. He will ask you to either visit Father Rubalkabara, Mother Marthilda, or Father Yosuke (see below for details). Once you speak to the designated NPC, go back to Father Mareusis and he will change you to an acolyte. Near St. Capitolina Abbey, 1 map North, and 2 maps East of Prontera. That is the Yoyo/Smokie/Choco map. Becareful of Chocos, they are aggressive. Simply talk to him until he finish talking. One map north from the town of Morroc. Morroc is SouthWest from Prontera. She is at the top left corner of the map. Simply talk to her until she finish talking. He is on a very small island (located at the center of the map) 2 maps West, and 1 map North, of Prontera.